So instead of posting another video update of myself talking into the camera and playing a little Ukulele for you, I've done something a little different for this post. Earlier this week I talked to two of my classmates who were also learning instruments for their learning project and we thought it would be kind of cool to do a group video-blog and try to learn a song together and record our progress playing our respective instruments. This was a really interesting experience for me because I wasn't sure what to expect going into it because up until this point I've only practiced playing the Ukulele alone. At first it was definitely a challenge because we all had to pick a song that was easy enough that we would all be able to play. The song we selected for our first Jam Session was "Free Falling" by Tom Petty. I liked our choice for this song because it was relatively easy to learn as it was only a 3 chord song. On Ukulele I only had to play the D, G and A chords so it didn't take very long to figure out. 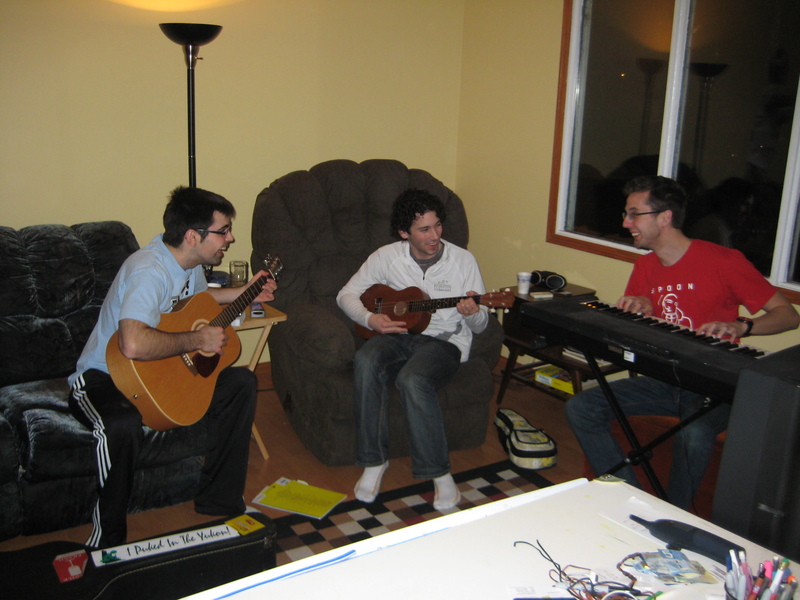 The second aspect of the Jam Session that I found challenging was definitely our timing as a group! As you will be able to hear in the Podcast and see in the Video is how off our timing is in the beginning of each. I didn't realize how hard it is to actually nail timing down when you play in a band because when you listen to music it just seems so natural and easy, but as we learned, it takes some practice. By the end of our recordings you can definitely see some improvement in our chemistry together as a (band?) and our next session will definitely be much easier than our initial attempt. We are definitely going to get together in the near future to film another group Video Blog and we would love some help from you on what song we should learn next as a group as well as a possible band name for us! Here is our second V-Log that we recorded with much better lighting! You can definitely see some improvement in our timing as compared to how we sounded in the podcast. My group members for this Jam Session were Kirk Fiege on Piano and Nick Barnes on Guitar. You should definitely check out their blogs to view their individual progress on learning their respective instruments as well! What does iPad 3's release mean?